Somerset County is a county located in the U.S. state of New Jersey. As of the 2017 Census estimate, the county's population was 335,432, a 3.7% increase from the 2010 United States Census, making it the 13th most populous of the state's 21 counties. Somerset County is part of the New York Metropolitan Area. Its county seat is Somerville. The most populous place was Franklin Township, with 62,300 residents at the time of the 2010 Census, while Hillsborough Township, covered 55.00 square miles (142.4 km2), the largest total area of any municipality. In 2015, the county had a per capita personal income of $86,468, the second highest in New Jersey and ranked 25th of 3,113 counties in the United States. Somerset County, as of the 2000 Census, was the seventh wealthiest county in the United States by median household income at $76,933 (third in New Jersey behind Hunterdon County at $79,888 and Morris County at $77,340), fourth in median family income at $90,655 (second in New Jersey behind Hunterdon County at $91,050) and ranked seventh by per capita income at $37,970 (highest in New Jersey). The Bureau of Economic Analysis ranked the county as having the 11th-highest per capita income of all 3,113 counties in the United States (and the highest in New Jersey) as of 2009. In 2012, 49.8 percent of Somerset County residents were college graduates, the highest percentage in the state. Somerset County was recently ranked number 3 of 21 NJ counties as one of the healthiest counties in New Jersey, according to an annual report by County Health Rankings and Roadmaps. Somerset County was created on May 14, 1688, from portions of Middlesex County. In 1917, Somerset County, in cooperation with Rutgers University, hired its first agricultural agent to connect local farmers with expert advice. The Rutgers Cooperative Extension of Somerset County, located in Bridgewater, serves residents in the areas of agriculture and natural resources, 4-H youth development and family and community health sciences. In the 1960s, townships that were once exclusively agricultural were quickly transformed into suburban communities. Examples include Bridgewater Township and the Watchung Hills communities of Watchung, Green Brook and Warren Township. This growth was aided by the development of the county's very strong pharmaceutical and technology presence. Warren Township used to be considered "the greenest place in New Jersey." More recently, there has been an influx of New York City commuters who use NJ Transit's Raritan Valley Line and Gladstone Branch or use Interstate 78. According to the 2010 Census, the county had a total area of 304.86 square miles (789.6 km2), including 301.81 square miles (781.7 km2) of land (99.0%) and 3.04 square miles (7.9 km2) of water (1.0%). 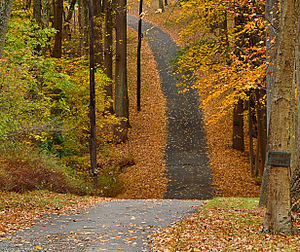 The high point is on Mine Mountain in Bernardsville, at approximately 860 feet (260 m) above sea level. The lowest point is just above sea level on the Raritan River at the Middlesex County line. In recent years, average temperatures in the county seat of Somerville have ranged from a low of 18 °F (−8 °C) in January to a high of 85 °F (29 °C) in July, although a record low of −16 °F (−27 °C) was recorded in January 1984 and a record high of 105 °F (41 °C) was recorded in August 1955. Average monthly precipitation ranged from 2.84 inches (72 mm) in February to 4.83 inches (123 mm) in July. As of the 2010 United States Census, there were 323,444 people, 117,759 households, and 84,668.721 families residing in the county. The population density was 1,071.7 per square mile (413.8/km2). There were 123,127 housing units at an average density of 408 per square mile (158/km2). The racial makeup of the county was 70.06% (226,608) White, 8.95% (28,943) Black or African American, 0.17% (556) Native American, 14.11% (45,650) Asian, 0.03% (94) Pacific Islander, 4.13% (13,360) from other races, and 2.55% (8,233) from two or more races. Hispanic or Latino of any race were 13.01% (42,091) of the population. There were 117,759 households out of which 35.9% had children under the age of 18 living with them, 58.8% were married couples living together, 9.5% had a female householder with no husband present, and 28.1% were non-families. 23.3% of all households were made up of individuals, and 8.5% had someone living alone who was 65 years of age or older. The average household size was 2.71 and the average family size was 3.22. In the county, the population was spread out with 25% under the age of 18, 6.5% from 18 to 24, 26.4% from 25 to 44, 29.8% from 45 to 64, and 12.4% who were 65 years of age or older. The median age was 40.2 years. For every 100 females there were 95.1 males. For every 100 females ages 18 and older there were 91.8 males. At the 2000 United States Census there were 297,490 people, 108,984 households and 78,359 families residing in the county. The population density was 976 per square mile (377/km²). There were 112,023 housing units at an average density of 368 per square mile (142/km²). The racial makeup of the county was 79.34% White, 7.53% Black or African American, 0.13% Native American, 8.38% Asian, 0.04% Pacific Islander, 2.74% from other races, and 1.83% from two or more races. 8.68% of the population were Hispanic or Latino of any race. Among those residents listing their ancestry, 18.7% were of Italian, 15.6% Irish, 14.5% German, 9.6% Polish and 7.1% English ancestry according to Census 2000. Age distribution was 25.50% under the age of 18, 5.90% from 18 to 24, 33.80% from 25 to 44, 23.50% from 45 to 64, and 11.20% who were 65 years of age or older. The median age was 37 years. For every 100 females, there were 95.40 males. For every 100 females age 18 and over, there were 92.10 males. The median household income was $76,933 and the median family income was $90,605. Males had a median income of $60,602 versus $41,824 for females. The per capita income for the county was $37,970. About 2.3% of families and 8.8% of the population were below the poverty line, including 3.7% of those under age 18 and 4.9% of those age 65 or over. Somerset County parks include Lord Stirling Park (part of the Great Swamp National Wildlife Refuge), Colonial Park (with a lovely rose garden), Washington Valley Park (with biking and hiking trails), the Sourland Mountain Preserve (hiking and mountain biking trails), and the newest park in development called Raritan River Greenway (which is being developed along the Raritan River in Bridgewater Township). Trump National Golf Club in Bedminster is an exclusive golf club owned by Donald Trump. The Somerset Patriots are a professional baseball team who plays at the 6,100-seat TD Bank Ballpark, located on the border of Bridgewater and Bound Brook. They play in the independent Atlantic League of Professional Baseball. Somerset County is governed by a five-member Board of Chosen Freeholders, whose members are elected at-large to three-year terms of office on a staggered basis, with one or two seats coming up for election each year. At an annual reorganization meeting held on the first Friday of January, the board selects a Director and Deputy Director from among its members. In 2016, freeholders were paid $21,902 and the freeholder director was paid an annual salary of $22,902. The Freeholders employ a full-time County Administrator who manages the day-to-day operations of County government. The County Administrator is Michael J. Amorosa. The Clerk of the Board of Freeholders oversees the work of their offices. Department heads are appointed in accordance with statute and by resolution of the board. Somerset County currently has approximately 1,100 full-time and 130 part-time employees in 52 divisions (including the Library System). The Somerset County Prosecutor is Michael H. Robertson of the Basking Ridge section of Bernards Township, who was nominated by Governor of New Jersey Chris Christie in September 2016. Somerset County is a part of Vicinage 13 of the New Jersey Superior Court (along with Hunterdon County and Warren County), which is seated at the Somerset County Courthouse in Somerville; the Assignment Judge for Vicinage 15 is Yolanda Ciccone. The 7th and 12th Congressional Districts cover the county. For the 116th United States Congress. New Jersey's Seventh Congressional District is represented by Tom Malinowski (D, Rocky Hill). For the 116th United States Congress, New Jersey's Twelfth Congressional District is represented by Bonnie Watson Coleman (D, Ewing Township). The county is part of the 16th, 17th, 21st, 22nd, 23rd and 25th Districts in the New Jersey Legislature. For the 2018–2019 session (Senate, General Assembly), the 16th Legislative District of the New Jersey Legislature is represented in the State Senate by Christopher Bateman (R, Branchburg) and in the General Assembly by Andrew Zwicker (D, South Brunswick) and Roy Freiman (D, Hillsborough Township). For the 2018–2019 session (Senate, General Assembly), the 17th Legislative District of the New Jersey Legislature is represented in the State Senate by Bob Smith (D, Piscataway) and in the General Assembly by Joseph Danielsen (D, Franklin Township, Somerset County) and Joseph V. Egan (D, New Brunswick). For the 2018–2019 session (Senate, General Assembly), the 21st Legislative District of the New Jersey Legislature is represented in the State Senate by Thomas Kean Jr. (R, Westfield) and in the General Assembly by Jon Bramnick (R, Westfield) and Nancy Munoz (R, Summit). For the 2018–2019 session (Senate, General Assembly), the 22nd Legislative District of the New Jersey Legislature is represented in the State Senate by Nicholas Scutari (D, Linden) and in the General Assembly by Linda Carter (politician) (D, Plainfield) and James J. Kennedy (D, Rahway). Carter was appointed in May 2018 to fill the vacant seat left following the death of Jerry Green the previous month after 26 years of service. For the 2018–2019 session (Senate, General Assembly), the 23rd Legislative District of the New Jersey Legislature is represented in the State Senate by Michael J. Doherty (R, Washington Township, Warren County) and in the General Assembly by John DiMaio (R, Hackettstown) and Erik Peterson (R, Franklin Township, Hunterdon County). For the 2018–2019 session (Senate, General Assembly), the 25th Legislative District of the New Jersey Legislature is represented in the State Senate by Anthony Bucco (R, Boonton Town) and in the General Assembly by Tony Bucco (R, Boonton Township) and Michael Patrick Carroll (R, Morris Township). As of October 31, 2014, there were a total of 216,901 registered voters in Somerset County, of whom 55,782 (25.7%) were registered as Democrats, 53,345 (24.6%) were registered as Republicans and 107,546 (49.6%) were registered as Unaffiliated. There were 228 voters registered to other parties. Among the county's 2010 Census population, 67.1% were registered to vote, including 75.% of those ages 18 and over. In the 2004 presidential election, George W. Bush carried Somerset County by a 4.3% margin over John Kerry, with Kerry carrying the state by 6.7% over Bush. However, in 2008, Barack Obama became the first Democratic Presidential nominee to carry the county since Lyndon Johnson in 1964, and only the second since 1936. Obama won Somerset by a 6.1% margin over John McCain, with Obama carrying the state by 15.5% over McCain. Somerset's growing Democratic trend at the presidential level has largely been spurred by the rapid growth of the overwhelmingly Democratic Franklin Township in the county's southwest corner. In the 2009 Gubernatorial Election, Republican Chris Christie received 56% of the vote, defeating Democrat Jon Corzine, who received around 34%. In the 2012 presidential election, the county was carried by Barack Obama, winning 52.8% of the vote to Mitt Romney's 47.2%, a 5.6% gap that represented a 0.5% drop off for Obama from his 2008 margin of victory in the county. On August 13, 2013, a Somerset County Sheriff's Officer Tim Pino successfully lobbied the New Jersey Legislature to change the way it protected law enforcement animals and the families they live with. To this day Dano's Law remains the only law in the history of New Jersey to be named after an animal. Dano's Law was co-sponsored by Senator Christopher Bateman and Assemblyman Peter Biondi of Legislative District #16. In 1996, Nicholas L. Bissell Jr., then county prosecutor, was charged with embezzlement, tax fraud and abuse of power. He fled to Laughlin, Nevada, near Las Vegas and took his own life when the federal authorities attempted to arrest him. Based on IRS data for the 2004 tax year, Somerset County taxpayers had the ninth-highest average federal income tax liability per return in the country. Average tax liability was $16,502, representing 16.8% of Adjusted Gross Income. Raritan Valley Community College, North Branch section of Branchburg Township (public). Rutgers University has a partnership with Raritan Valley Community College which allows students who have an accredited associate degree to complete a bachelor's degree by attending Rutgers classes at RVCC's North Branch campus. The degree completion program is specifically designed to cater to the transfer student looking to complete their bachelor's degree while staying close to home. Somerset Christian College, now known as Pillar College, is located in the Zarephath section of Franklin Township (private). Alma White College (which operated from 1921 to 1978) was a private college located in Zarephath. Beginning in 1931 the college operated WAWZ 1380 on the AM radio dial. The station continued to 1984 after the school closed. The building is now occupied by Somerset Christian College. Somerset Hills Learning Institute, founded in 1998 and now located in Bedminster Township, is a state-of-the-art program dedicated to educating children on the autism spectrum by utilizing the principles of applied behavior analysis. Municipalities in Somerset County (with 2010 Census data for population, housing units and area) are listed below. Other, unincorporated communities in the county are listed alongside their parent municipality (or municipalities, as the case may be). 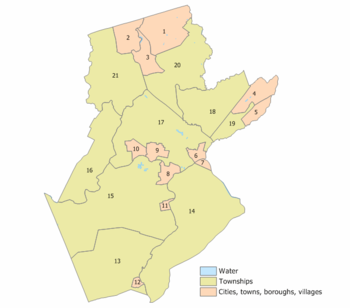 These areas include census-designated places (CDPs), which have been created by the United States Census Bureau for enumeration purposes within a Township. Other communities, historical areas, unincorporated areas, and enclaves that exist within a municipality are also listed. Somerset County is served by a number of different routes. As of May 2010[update], the county had a total of 1,714.99 miles (2,760.01 km) of roadways, of which 1,370.80 miles (2,206.09 km) were maintained by the local municipality, 234.23 miles (376.96 km) by Somerset County and 109.96 miles (176.96 km) by the New Jersey Department of Transportation. Major county roads that pass through include County Route 512, County Route 514, County Route 518, County Route 523, County Route 525, County Route 527, County Route 529, County Route 531 and County Route 533. The only two state routes that traverse through are Route 27 (only in Franklin) and Route 28. U.S. Routes include U.S. Route 22, U.S. Route 202 and U.S. Route 206. The two interstates that pass through are Interstate 78 and Interstate 287. Interstate 95 was planned to run along the Somerset Freeway from its proposed southern end in Hopewell Township, Mercer County to Franklin Township at I-287 in the 1960s. However, this plan was cancelled in 1983. Route 18 runs at the New Brunswick border of Somerset. NJ Transit provides train service on the Gladstone Branch and the Raritan Valley Line. Public bus transportation is provided by several transit agencies. NJ Transit provides bus service to the Port Authority Bus Terminal in Midtown Manhattan, as well as service to major cities in New Jersey and within Somerset County. Ridewise provides three SCOOT shuttles as well as DASH buses and CAT buses. ^ a b c Snyder, John P. The Story of New Jersey's Civil Boundaries: 1606-1968, Bureau of Geology and Topography; Trenton, New Jersey; 1969. p. 221. Accessed October 30, 2012. ^ a b c d e f DP1 - Profile of General Population and Housing Characteristics: 2010 Demographic Profile Data for Somerset County, New Jersey, United States Census Bureau. Accessed March 25, 2016. ^ a b QuickFacts - Somerset County, New Jersey; New Jersey; United States, United States Census Bureau. Accessed March 24, 2018. ^ 250 Highest Per Capita Personal Incomes available for 3113 counties in the United States: 2015, New Jersey Department of Labor and Workforce Development. Accessed October 24, 2017. ^ Local Area Personal Income: 2015, Bureau of Economic Analysis. Accessed October 24, 2017. ^ "Census 2000 Data Rankings; A data rankings document focused on the Roanoke Valley and Alleghany Highlands region" Archived October 23, 2013, at the Wayback Machine, Roanoke Valley-Alleghany Regional Commission, p. 22. Accessed October 6, 2013. ^ 250 Highest Per Capita Personal Incomes of the 3113 Counties in the United States, 2009 Archived December 12, 2011, at the Wayback Machine, Bureau of Economic Analysis. Accessed April 9, 2012. ^ 2012 New Jersey Legislative District Data Book Available for Order, Rutgers University. Accessed May 13, 2015. ^ "Rankings". County Health Rankings & Roadmaps. Retrieved February 1, 2018. ^ Home Page, Rutgers Cooperative Extension of Somerset County. Accessed January 11, 2017. ^ The History of Bridgewater Township, Bridgewater Township, New Jersey. Accessed March 24, 2018. "In the early years, Bridgewater was known as a farming town." ^ a b Sordillo, Victor J. About Warren Township, Warren Township. Accessed October 1, 2013. "Once described as 'the greenest place in New Jersey', Warren Township residents and elected officials are working to keep its rural character and charm while recognizing that there will be growth due to the town's beauty, favorable property taxes and strategic location. Less than 35 miles to Manhattan makes Warren Township a favorite suburb for commuters to New York City." ^ Overview, Green Brook Historical Society. Accessed October 1, 2013. "As the traffic through the corridor expanded, Green Brook Township developed from a quiet farming community, which it had been for nearly two hundred years, into the suburban community that it is today." ^ History, Borough of Watchung. Accessed October 1, 2013. "Watchung was settled in the early eighteenth century and grew slowly until recent years. In 1960 the population was 3,312 and in 2000 it was 5,613." ^ Census 2010 U.S. Gazetteer Files: New Jersey Counties, United States Census Bureau. Accessed May 13, 2015. ^ Areas touching Somerset County, MapIt. Accessed January 19, 2015. ^ a b Monthly Averages for Somerville, New Jersey, The Weather Channel. Accessed October 13, 2012. ^ a b c d DP-1 - Profile of General Demographic Characteristics: 2000; Census 2000 Summary File 1 (SF 1) 100-Percent Data for Somerset County, New Jersey, United States Census Bureau. Accessed January 23, 2013. ^ a b c Tables DP-1 to DP-4 from Census 2000 for Somerset County, New Jersey, United States Census Bureau, backed up by the Internet Archive as of July 6, 2008. Accessed October 1, 2013. ^ DP-2 - Profile of Selected Social Characteristics: 2000 from the Census 2000 Summary File 3 (SF 3) - Sample Data for Somerset County, New Jersey, United States Census Bureau. Accessed September 30, 2013. ^ DP-3 - Profile of Selected Economic Characteristics: 2000 from Census 2000 Summary File 3 (SF 3) - Sample Data for Somerset County, New Jersey, United States Census Bureau. Accessed September 30, 2013. ^ Parks & Facilities, Somerset County Park Commission. Accessed October 6, 2013. ^ Delaware & Raritan Canal State Park, New Jersey Department of Environmental Protection Division of Parks and Forestry. Accessed October 6, 2013. ^ Welcome, Trump National Golf Club. Accessed October 6, 2013. "Greetings from Donald J. Trump: When I saw this beautiful piece of property in Bedminster, New Jersey, I knew that it deserved only the best." ^ About TD Bank Ballpark, Somerset Patriots. Accessed October 23, 2017. ^ Elected Officials, Somerset County, New Jersey. Accessed October 22, 2017. ^ Gallo Jr., Bill. "Which N.J. county freeholders are paid the most? ", NJ.com, March 11, 2016. Accessed October 25, 2017. "Freeholder director: $22,902; Other freeholders: $21,902"
^ Administrator's Office, Somerset County, New Jersey. Accessed October 24, 2017. ^ The Role of County Government Archived March 24, 2008, at the Wayback Machine, Somerset County. Accessed February 19, 2014. ^ 2018 Somerset County Board of Chosen Freeholders, Somerset County, New Jersey. Accessed November 12, 2018. ^ 2018 County Data Sheet, Somerset County, New Jersey. Accessed November 12, 2018. ^ a b 2018 Somerset County Directory, Somerset County, New Jersey. Accessed November 12, 2018. ^ Somerset County 2018 Winners List, Somerset County, New Jersey. Accessed January 1, 2018. ^ Somerset County General Election November 7, 2017 Winners List, Somerset County, New Jersey, dated November 15, 2017. Accessed January 1, 2018. ^ Somerset County General Election November 8, 2016 Winners List, Somerset County, New Jersey, dated November 17, 2016. Accessed January 30, 2017. ^ Somerset County - General Election November 3, 2015 Winning Candidates, Somerset County, New Jersey. Accessed July 31, 2016. ^ Brian G. Gallagher, Somerset County, New Jersey. Accessed November 12, 2018. ^ Brian D. Levine, Somerset County, New Jersey. Accessed November 12, 2018. ^ a b Staff. "NJ elections: 2018 Somerset County results, town by town", Courier News, November 5, 2018. Accessed Jnaiuray 1, 2019. ^ Patricia L. Walsh, Somerset County, New Jersey. Accessed November 12, 2018. ^ County Clerk Steve Peter, Somerset County, New Jersey. Accessed January 22, 2018. ^ Members List: Clerks, Constitutional Officers Association of New Jersey. Accessed November 12, 2018. ^ Frank J. Provenzano Sr., Sheriff, Somerset County Sheriff's Office. Accessed November 12, 2018. ^ Members List: Sheriffs, Constitutional Officers Association of New Jersey. Accessed November 12, 2018. ^ Somerset County Surrogate, Somerset County, New Jersey. Accessed November 12, 2018. ^ Members List: Surrogates, Constitutional Officers Association of New Jersey. Accessed November 12, 2018. ^ Somerset County Prosecutor's Office, Somerset County, New Jersey. Accessed October 24, 2017. ^ Governor Chris Christie Files Nominations Archived October 25, 2017, at the Wayback Machine, Governor of New Jersey Chris Christie, press release dated September 8, 2016. Accessed October 24, 2017. "Somerset County Prosecutor - Nominate for appointment Michael H. Robertson (Basking Ridge, Somerset)"
^ Somerset / Hunterdon / Warren Vicinage, New Jersey Courts. Accessed October 23, 2017. ^ Plan Components Report, New Jersey Department of State Division of Elections, December 23, 2011. Accessed January 23, 2013. ^ 2011 Legislative Districts by County, New Jersey Department of State Division of Elections. Accessed October 6, 2013. ^ District 17 Legislators, New Jersey Legislature. Accessed January 22, 2018. ^ District 21 Legislators, New Jersey Legislature. Accessed January 22, 2018. ^ a b Statewide Voter Registration Summary, New Jersey Department of State Division of Elections, as of October 31, 2014. Accessed May 11, 2015. ^ GCT-P7: Selected Age Groups: 2010 - State -- County / County Equivalent from the 2010 Census Summary File 1 for New Jersey, United States Census Bureau. Accessed May 11, 2015. ^ New Jersey Presidential Election Returns by County 2004 Archived September 14, 2008, at the Wayback Machine, Eagleton Institute of Politics at Rutgers University. Accessed August 31, 2008. ^ Toscano, Paul. "Obama Wins 8 of the Nation's 10 Wealthiest Counties ", CNBC, November 7, 2012. Accessed December 10, 2012. ^ Official List Candidates for President For GENERAL ELECTION 11/06/2012 Election, New Jersey Department of State, December 6, 2012. Accessed December 10, 2012. ^ Leip, David. "Dave Leip's Atlas of U.S. Presidential Elections". uselectionatlas.org. Retrieved June 10, 2018. ^ Glaberson, William. "In Prosecutor's Rise and Fall, a Story of Ambition, Deceit and Shame. ", The New York Times, December 1, 1996. Accessed August 30, 2014. "When Nicholas L. Bissell Jr. put a gun in his mouth and pulled the trigger in a $20 room on a neon strip here, it was almost the cliche ending to an ambitious man's rise and fall. An unexceptional child of New Jersey's modest suburbs, he rose to become a feared prosecutor in Somerset County known for his swaggering assault on drug dealers." ^ Biggest Income Tax Burdens: Top 10 Places, CNN Money. Accessed April 28, 2007. ^ RVCC: History, Mission, Diversity Statement & Core Values, Raritan Valley Community College. Accessed October 6, 2013. ^ Rutgers Off Campus - Raritan Valley, Rutgers University. Accessed October 28, 2013. ^ About Pillar College Archived December 7, 2013, at the Wayback Machine, Pillar College. Accessed October 6, 2013. ^ Closed & Renamed New Jersey Colleges & Universities, New Jersey Department of State Office of the Secretary of Higher Education. Accessed October 30, 2017. ^ History, Somerset Hills Learning Institute. Accessed October 29, 2017. ^ GCT-PH1: Population, Housing Units, Area, and Density: 2010 - County -- County Subdivision and Place from the 2010 Census Summary File 1 for Somerset County, New Jersey, United States Census Bureau. Accessed May 14, 2015. ^ Locality Search, State of New Jersey. Accessed May 11, 2015. ^ Somerset County Mileage by Municipality and Jurisdiction, New Jersey Department of Transportation, May 2010. Accessed July 24, 2014. ^ Gladstone Branch Raritan Valley Line, NJ Transit. Accessed October 6, 2013. ^ Raritan Valley Line, NJ Transit. Accessed October 6, 2013. ^ Transportation Services Archived August 29, 2014, at the Wayback Machine, Somerset County, New Jersey. Accessed October 1, 2013. ^ Somerset County Bus / Rail Connections, NJ Transit, backed up by the Internet Archive as of May 22, 2009. Accessed October 6, 2013. ^ Scoot, Ridewise. Accessed October 1, 2013. ^ DASH, Ridewise. Accessed October 1, 2013. ^ CAT, Ridewise. Accessed January 19, 2015. Wikimedia Commons has media related to Somerset County, New Jersey. Wikivoyage has a travel guide for Somerset County (New Jersey).